Some of you may have noticed over the past couple of years that our site updates haven't been as regular as they used to be, and I feel that now is a good time to fill you in on why that has been. I've run DWO for the best part of 22 years, and, all being well, I hope to do so for a good time to come, but for the past couple of years the regular updates have been somewhat of a struggle due to some ongoing issues with my health. It all started when I was exhibiting at the 2015 London Film And Comic Con (which was a fantastic event, by the way). We had the DWO space set up, and got to meet so many of our lovely visitors and twitter followers - I had my wife on hand to help out, and things were going very well indeed. On the morning of the Sunday show, we arrived and I wasn't feeling great; for some reason I was feeling a bit panicked. I literally could't think of anything that was panicking me, nor could I comprehend why I was feeling this way. I started to become very aware of everything, and it felt like the space around me was closing in a bit. The lights started to feel a bit more intense and I began to feel my heart racing - like, super fast! I was naturally feeling quite anxious, and decided to make my way to the medial booth on the upper floor. As I got to the staircase, every step felt laboured, and I was starting to feel a little light-headed. I finally got to the office and the very helpful woman asked me to sit in a chair as she took my blood pressure and other stats. My heart rate was around 170bpm (beats per minute), and I was just sat in the chair. She talked to me to calm me down, and it eventually slowed to around 120bpm. By this point, my hands were physically shaking, due to the adrenaline that was rushing through me. The woman asked me some questions; "Have you ever had a heart issue? ", "Have you ever been diagnosed with a heart attack?, "Do you suffer from anxiety?". I replied "No" to all three questions, and sipped on some cold water, which helped to relax me further. She then suggested that I go to the hospital to get some precautionary blood tests to rule out anything sinister. My wife and I stayed for an hour whilst I contemplated whether to go right away or not, before deciding that we would in fact leave. I got to our local hospital, and they ran some tests, and everything checked out normal. On paper I was fit and healthy, and nothing seemed to be wrong. In my head, however, I was confused and unsatisfied with the fact that there was no diagnosis for what had happened to me earlier that day. This was something that has never happened to me before. A few weeks passed by, and I was at home with my wife and kids, and we were having our dinner, when, again, out of nowhere, my heart was racing once more - this time around 180bpm. I made my way to the hospital, where they did some tests again, and could see the high heart rate. Again, I was asked if I suffered from anxiety, to which I responded "No", but I felt like this was a word that kept being thrown at me - like it was something I was meant to accept. They let me go and asked me to get an appointment with my GP to set up a referral to a cardiologist. A day or so later, I met with my GP and we set up the appointment, which was for a few weeks from that date. During that time, I had several more incidents of my heart racing - a couple of the times I was at home on my own, and for the first time ever, I called an Ambulance. I was finding my breathing was somewhat laboured, and was trying to breathe through the fast heart rate (which, can make you feel quite breathless, alone), and, again, they checked me over and couldn't find a cause. I eventually got my appointment with the Cardiologist, who did a number of tests; ECGs, a running test and more in-depth blood tests, but all of them seemed to draw a blank. He suggested I go on some beta blockers to manage the issue, and I went onto a medication called 'Propanolol'. At first it seemed to work, as the events were happening less frequently, but days later, I started to notice a small red patch on my left arm. It didn't occur to me that it could be related to the medication as it was happening at such a slow rate, but over the next 9 months, the red patches covered the whole of my body. 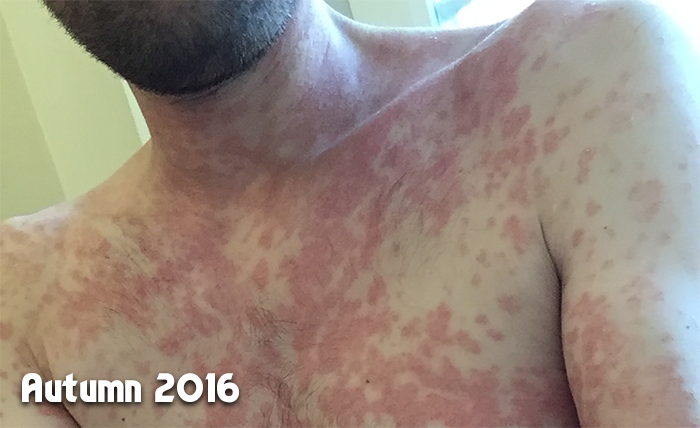 I went to the Doctors, who, after numerous tests, put it down to a condition called Psoriasis. For 9 months I was dealing with the red patches, and I was incredibly self conscious to go out in public and be seen; my face was the only place I wasn't really getting them, but you could see them on my neck, which forced me to wear long-sleeve shirts and jumpers during a particularly hot summer. It was at this point, that I started to realise the affect this was having on my mental state. I was given a special lotion which was paraffin based (the same stuff you use to light a fire, although on a much, much lower scale). It helped a little to reduce the visibility, but was not recommended over long periods of time. Having been feeling rather low and unhappy about the situation for some time, I asked my GP about setting me up with a Dermatologist, and a few weeks later, she confirmed that this was indeed Psoriasis and that, unfortunately, it would be something I would have to deal with throughout my life, although there were treatments to help lessen the red marks. I was given bath liquids, whole body lotions and the most foul-smelling cold tar lotion, which I had to put on twice daily. A few days later I had another of my heart issues and was given an alternative beta blocker to try. I came off the Propanolol and went onto something called Verapamil. The first 24 hours seemed fine, and then in the evening I had another fast heart rate, with what I now know to be a panic attack. It was single-handedly the most terrifying experience I've had to date... I went to the hospital who actually kept me overnight this time, and was given another new beta blocker to try called 'Bisoprolol'. This one seemed to work perfectly! Days and weeks passed without any large events, and I was starting to feel a bit better. The red marks on my skin also appeared to be fading, and I finally felt that things were moving in a positive direction. Something was niggling away at the back of my mind though, and it was the fact that the heart situation was still undiagnosed. By this point, I started to feel like I was being pigeon-holed in the 'anxiety' box. There was no doubt that I was anxious, but I felt that it was a result of the process to this point (now going on 16 months), and the fact I still didn't know what was causing it. By now it was March of 2017, and the red marks were almost gone. I had a follow-up appointment in a few days with the Dermatologist, and was hoping for her to tell me that this was now managed. My wife was looking online and found that a side effect of the original beta blocker I was on was "red marks on the skin". We started doing our maths and worked out that it was almost to the week that I went onto the Propanolol (my original beta blocker), that I started to get the red marks. My Dermatology appointment came around and I brought it up to the specialist. She looked at my skin, and how vastly improved it was, and confirmed that this was now likely an interaction due to my body being intolerant to the Propanolol. I came out from the appointment relieved and angry; relieved that this wasn't something I'd have to constantly battle throughout my life, but angry that this wasn't picked up - or even suggested, by my GP. Days, weeks and months went by, and by now we were coming to the Summer 2017. My skin had completely cleared up, I was getting confidence to go out more, and my heart rate was managed by the bisoprolol, to the point that I started to reduce my dosage to the point I didn't need to take it anymore. I did still get the faster heart rate, but I managed it by breathing through it or trying to focusing on something else. I had another appointment with my Cardiologist where I expressed my happiness at the fact the incidents had reduced, but my frustration at still not knowing why or how it started in the first place. The cardiologist suggested I have a small procedure to fit an implant (the size of a USB stick) just under my skin on the left side of my chest, which would constantly monitor my heartbeat, and pick up any irregularities. I was nervous at the thought of being in an operating theatre - even through it was a small procedure - but I had it fitted, and tried to forget about it. From now on, whenever I had an incident, I just pressed a button on a key fob and held it over the left side of my chest, and it would monitor 5 minutes before and after the event. Before long, the hospital had enough data to finally give me a diagnosis. January 2018 came around, and I met up with the cardiologist, who confirmed it was something called 'Inappropriate Sinus Tachycardia'. It's not life-threatening, but just gets in the way of things now and then. He also added that over time, it could completely sort itself out. There were a few more back-and-forth's with my GP, but all this time later, I finally feel much better and confidant in myself that I can deal with future episodes. That being said, the toll it has taken on me, mentally, has been exhausting to say the least. I still have a distrust at my body in the way it just came out of nowhere, and my confidence has taken a bit of a beating through all of this, too. I was previously a confidant person, and this is something I need to work on again. Ironically, and despite the incorrect analysis of what was wrong with me at the start, anxiety now seems to be a part of me as a result of all this, and I'm working through it. It has made me become so much more aware of others who have to deal with it, and want to give more time to those who have their own struggles. We take so many things for granted, and to have your health - arguably the most basic thing that we take for granted - is something we must all be thankful for. So back to DWO... Whilst there have been loads of DWO updates over the past couple of years, there were nowhere near as many as I would have liked, due to the constant fragmentation of my daily life due to my health issues. This is a site that used to have almost daily news updates, but thankfully, I feel like I am back to the point where normal service can be resumed. This is going to be a truly exciting year for Doctor Who, and I want to be where I've always been, right here on DWO, along with my fantastic team, providing you all with the very latest news, reviews and updates. Thanks for reading this and allowing me to explain fully the reason for the lack of updates. There's probably more information than you needed, but I wanted to give you all the full picture and be clear about where I was at. Here on in, all is looking good and we have lots of exciting things planned for the site and forums in 2018! Thank you, as always, for your support and dedication to the site. It's you the visitors and forum members who make DWO what it is, and genuinely, from the bottom of my heart, it means so much to me. + Follow @SebastianJBrook on Twitter!